The slightly elevated position of the villa allows uninterrupted views of the Besparmak mountains to the south and views of the sea to the north. Bellapais Abbey and the ancient hill fortress of St Hilarion are lit up at night and clearly visible from our terraces and balconies. The covered veranda houses a large outdoor granite dining table, seating 8, and is where most meals take place. Next to the veranda is a large courtyard overlooking the garden and pool and is an ideal area for children to play. The extensive landscaped garden looks beautiful all year round and is managed by a team of gardeners who attend the plot twice a week. To the east of the villa is an orchard containing a variety of citrus and other fruits. The fruit tastes delicious picked straight from the trees! The garden is walled with plenty of parking space. A Turkish barbecue near the pool is a very popular amenity. There is lighting at night along the front wall of the villa, in the courtyard and veranda and inside the pool. The outside of the property looks stunning with the center piece being the 11 m. by 5 m overflow pool. It has Roman steps leading into the shallow end of the pool affording easy access for the young and elderly. There are separate steps down into the deep end. An outdoor shower is situated next to the pool. The ample terraces around the pool with loungers, umbrellas and side tables ensures there is plenty of space for large families. Inside the villa is fully air-conditioned with solar paneled water heating. Back up electric water heating is available if necessary and electric fans are provided. Central heating is installed for winter lets. The very large lounge and dining area, with a wooden table seating 8, has 5 sets of patio doors leading to the veranda, courtyard and pool. The luxury Siemens kitchen has a gas and electric hob with extractor unit, dishwasher, microwave and large fridge/freezer. Off the kitchen is the utility room with a large sink, washing machine, iron and ironing board and space for the high chair and other baby equipment. A large travel cot is provided. Downstairs we have 2 bedrooms, one with a king size bed and en suite shower/toilet and the other a twin room with a shower/toilet room just outside the door. Upstairs we have the master bedroom with a super king size bed, dressing room with a safe and an en suite bath/shower/toilet room with twin hand basins and views of the mountains and sea. There is a second bedroom upstairs with a king size bed, and en suite shower/toilet. A large balcony, accessed from the second bedroom upstairs, affords beautiful views of the mountains and sea from all sides of the villa. A second balcony is accessed from the master bedroom. All bedrooms have extensive built in wardrobes. The marble floors and stylish wall prints throughout, create a feeling of unashamed luxury. Wireless internet connection is available for a small charge. I was brought up in Nicosia, the capital of Cyprus. My father worked for the British Government when Cyprus was a British Colony. My husband and I now live in Sutton Coldfield in the West Midlands. We have 2 children, a son and a daughter and 4 grandchildren. My husband is retired, but I still tutor Mathematics. We are both keen tennis and golf players and I play at two bridge clubs. We have had both cats and dogs over the years, but as we travel quite a lot we have decided not to have any more just now. When we decided to buy a property abroad it was always going to be in Cyprus. As I lived for much of my childhood in Cyprus I have a great affection for it. We chose Ozankoy which is just outside Kyrenia as I remember as a child going over the mountains to Kyrenia and the sea most weekends. In those days it took an hour and a half , but now with the new road it just takes 25 mins. The particular location for Villa Joanna was chosen for its views of the sea and mountains and its location near Kyrenia and the sea with it's beaches. Villa Joanna was named after my daughter. All 4 bathrooms have stand alone showers, wc and wash basins. The master bathroom has an additional bath and twin hand basins with an attractive bathroom suite and views of the mountains and sea. A mid stay change of linen and bath towels together with a light clean is provided for stays of two weeks or more. The large living room has an open marble fireplace and seating for 8, with an archway leading to the dining room. It has satellite TV and DVD player. 3 sets of patio doors from the living room open onto the pool terrace. Luxury beech wood kitchen with granite work surfaces, Siemens appliances, including cooker,hob, extractor, oven, fridge, freezer, microwave, washing machine, dishwasher, kettle, toaster.There is a stand alone electric drinking water dispenser. There are a variety of boat trips available from Kyrenia Harbour. There are beaches where various water sports can be enjoyed. Many nearby hotels have tennis courts for hire. There is a brand new prestigious golf course and hotel 15 minutes drive away in Esentepe, sporting a spa and fantastic golf course which is beautifully landscaped. It also has a brand new, high quality gym and superb bar and restaurant facilities with wonderful views of the course from the upper terraces of the clubhouse. There are two 3" steps into the villa and 4 steps down to the pool with metal hand railings. Inside, the ground floor is flat. On the ground floor there are 2 bedroom and 2 bathrooms(one en-suite). Disabled guests have commented on the ease of maneuvering around on the marble flooring with large spaces between the furniture. The ground floor is open plan with large archways to the dining room and kitchen. The pool has a roman end with graduated steps into the pool. Notes on accommodation: A local English speaking representative is available to answer any questions you may have, or to offer help if needed. She will meet you at the villa shortly after arrival. Towels, linen and beach towels are provided. A mid stay light clean and change of bed linen and bath towels are provided for stays of two weeks or longer. We were delighted with Villa Joanna, it was exactly as advertised and what we hoped for;it is clean, airy & spacious. We were a group of 6 across 3 generations and everybody loved the villa. It has a very well equipped kitchen (not that we used it, the restaurants in the area are great and such good value). The pool and outdoor area we also clean with good furnishings. Pool a bit nippy in mid October though! There are lovely views to the sea from the back and we were able to sit on the veranda and watch a spectacular lightning storm roll in one evening. Barbara put us in touch with a local car hire company who also did our airport transfers, a seven seater arrived with 45 minutes of us getting to the villa at that was about 8pm. Do use the car hire company she recommends. Do use Mustafa to pick you up and run you around in the evening, he is a lovely guys and very reasonable. As others have said his English isn't great but I Whatsapped Tahir from the car hire company who arranged our pick ups with Mustafa after that the restaurant will call him if you give him your number when you need picking up. Do eat out; Errols, Eminem locally were excellent & authentic & Niazi's in Kyrenia for a full kebab shouldn't be missed. Do pay the little extra for wifi, Northern Cyprus is not in the EU & Roaming charges will kill you. Do go to St Helarion Castle the views are spectacular. No don't's really. We had a great time and if we return to this part of the world would definitely book Villa Joanna. Thank you for your kind review. I'm so pleased you enjoyed your stay in Villa Joanna and able to use Mustafa to take you out and about when you opted not to drive. I have only ever had good comments made about him. We had a lovely peaceful stay. Communication and advice was excellent. A technical issue with the fresh water pump was quickly resolved. We hope to return next year. We're so pleased that you enjoyed your stay in Villa Joanna. We would be delighted to welcome you again next year. Six of us Friends have recently returned from 2 weeks at Villa Joanna.It is the perfect place to unwind and spend Quality Time together.The Villa has everything to make your stay stress free and has all the comforts of home.We did very little apart from eating drinking and relaxing,but you are near Many place of interest. ( Bellapais Abbey,Kyrenia,with the Medieval Castle,Turtle Beach,Golf Course at Esentepe ) to name just a Few.You are just a 10 minute car ride from shops and restaurants.Our favourites were Errols and Five Finger Restaurants in Ozankoy Village.And The Kitchen on the Main Coast Road. You do need a Car and it takes a while to get your bearings and find your way back to the Villa.On the first night it took us over 35 minutes to find our way back to Villa.We had visions of having to sleep in the car,but it was all good fun.The pool was a focal point of our holiday,it was kept very clean by the pool man who came several times during our stay .The Garden and orchard were beautiful and they were cared for to perfection by the same pool man.We would have no hesitation in recommending to everyone and would love to return. This is the second time we have stayed at villa Joanna. Everything about the villa and it's location is perfect. Close to restaurants, supermarkets and beaches. This is my 7th year in this area and will be heading back again next year. I'm delighted you and your family enjoyed your second stay in Villa Joanna. Hopefully we will be able to welcome you all again in the not too distant future. We loved Villa Joanna! Wonderfully appointed and comfortable - a real home from home feeling. Dramatic location when the storms rolled in from the mountains behind but the view of the sea remained sunny. A car is essential and Karapasha looked after us well. Would recommend the house without reservation. I'm so glad that you, your children and grandchild had an enjoyable stay in Villa Joanna. When an occasional electric storm gets up it is great watching the lightning flashes out at sea from the safety of the villa! Northern Cyprus with its plethora of flora and fauna is incredibly beautiful and ideal for walking in the mountains and relaxing in the sun. This part of Cyprus is unspoilt in terms of development and Kyrenia itself has a long and interesting history. During the slightly cooler months organised walking trips are available. The Kyrenia mountains form an impressive backdrop to the fertile plains and coastal districts and old fashioned methods of farming have ensured that wild flowers flourish, whilst the under developed beaches are a sanctuary for Loggerhead and green turtles. Northern Cyprus is a hotspot for bird migration in the spring, within the 2 peninsulas of Korukam in the west and karpaz, known as 'the panhandle' in the east, providing welcome land for tired migrants. The history and heritage of northern Cyprus with its share of outstanding archaeological sites is well known but the real advantage is being able to enjoy yourselves without queues of visitors. Flights from Heathrow, Gatwick, Stansted, Manchester and Birmingham. It is 25 minutes from the nearest airport of Ercan in northern Cyprus but if transferring from Larnaca in the south the journey is 90 min (cost about £80 return per vehicle). We can arrange both hire car and transfer taxi to meet you at the airport. Car hire is essential. Ferry distance to Turkey is 40km. Kyrenia is 4km. Ozankoy is the nearest village to the villa, approx 2km. Ergin airport is 20km from the villa and it takes 25 mins to get there. Larnaca Airport in the south is 65km, 90 mins by car. Kyrenia town's key attraction is the wonderful harbour which many claim is the most beautiful in the Mediterranean. Lively tavernas line the harbour and colourful fishing boats and yachts bob on the water. Behind the harbour is a maize of small streets with an array of discrete restaurants. This is very atmospheric and well worth a visit. Ozankoy, a very pretty Cypriot village has a number of good restaurants, some of which are run by local English families which offer extremely good value. There is a curry house and a small family run pizzeria attached to the Five Fingers restaurant which has an English bookshop and craft centre. There are a number of fresh fish restaurants also in the village. Walking in the Kyrenia mountains is extremely popular, especially in the spring when there is an abundance of wild flowers and birds. Guided tours are available, many of which are organised by local British Residents. Endangered Loggerhead and green turtles come back to northern Cyprus to lay their eggs. The turtle conservation project is a short drive away, where during the summer season you can join organised groups to watch them lay and hatch their eggs. Wild donkeys roam free on the Karpaz peninsula 2 hours away. Here you will find extensive sandy beeches and a wonderful day out. Take time out to visit Bellapise abbey, St. Hilarion Castle, the Shipwreck Museum in Kyrenia and the fantastic ruins of Salamis. The coast of Turkey can be seen on good days about 40km from Kyrenia. Banks are accessible in Kyrenia 4km from the villa such as HSBC and Garanti and there are plenty of ATM machines. Large supermarket 5 mins drive away. Food and craft markets on different days of the week. Go carting: international standard circuit. Horse riding: 5 mins by car. Tennis: at local hotels. Concerts: mainly classical at Bellapaise abbey and Kyrenia castle. Also available are paragliding, mountain biking and clay pigeon shooting. Booking Notes: 25% deposit at time of booking. Rental balance and £150 per week breakages and electricity deposit is to be paid 60 days prior to arrival. The balance from the electricity and breakages deposit will be refunded within 14 days of departure. The electricity cost is calculated from a meter reading at the end of the holiday. The meter is located in the property garden and can be read by guests. Cancellation charges: up to 60 days prior to arrival deposit only. 55 to 29 days prior to arrival 60% total cost. 28 days or less prior to departure 100% of total cost. No hen or stag parties, or groups of adults under the age of 25. Changeover Day: Changeover days are flexible. 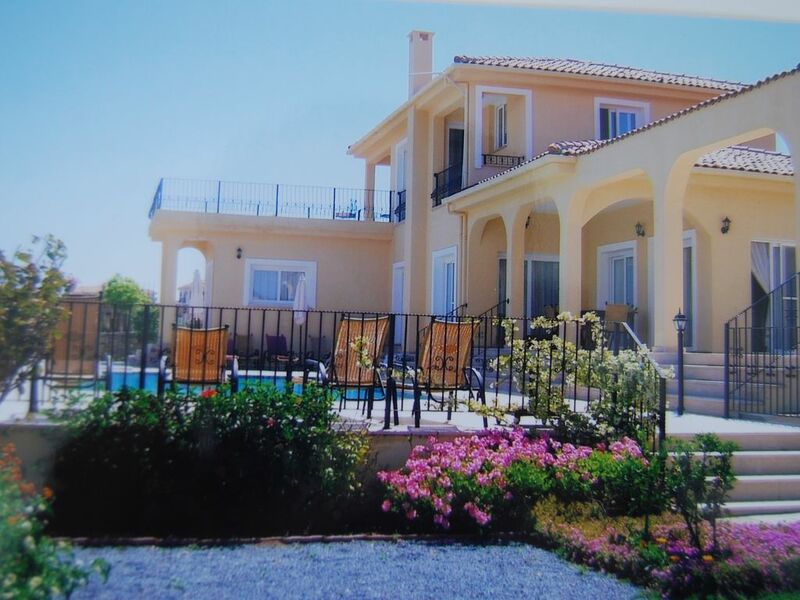 Villa available from 6pm on day of arrival and must be vacated by 10am on day of departure. Requests to adjust these times are dependent on back to back bookings. Notes on prices: Villa available from 6.00pm day of arrival and must be vacated by 10 am day of departure. Requests to adjust these bookings are dependant on back-to-back bookings.